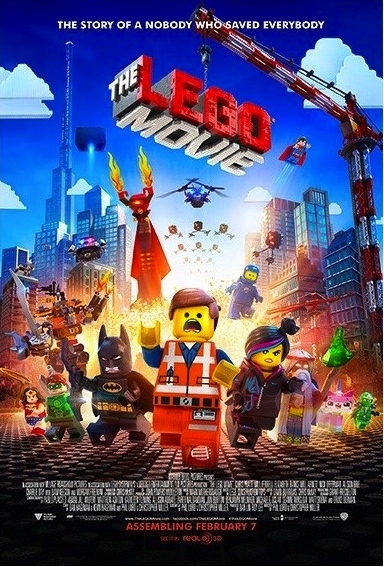 I just saw “The Lego Movie” and I am still trying to piece together the plot. Emmet (Chris Pratt from “Her”) is an ordinary construction worker who is very happy just following the instructions. One day, he meets a girl named Wyldstyle (Elizabeth Banks from “The Hunger Games”), and she likes him because she thinks he is special. Up until then, Emmet thought he was exactly like everyone else, and he kinda is. When a girl believes you are special and that you can do special things, you start to believe too. I learned that in seventh grade. She believes Emmet can stop President Business (Will Ferrell from “Anchorman”) from taking over the entire world. All he has to do is escape Bad Cop (Liam Neeson from “Non-Stop”) and unite all the master builders of the universe. Emmet starts to believe he is special, but he has trouble finding his footing. It’s almost as if he was trying to put a round peg in a square hole. He is guided by Vitruvius (Morgan Freeman from “Last Vegas”), who is convinced Emmet has arrived to fulfill the prophecy. Did I mention these were all Legos? I didn’t get that until about halfway through. I was starting to think this movie would get an Oscar for makeup, but – spoiler alert – they are all Legos. For Emmet to complete his journey, he must leave his home in Brickville and travel to other realms in the Lego world. For my screenwriting buddies, this is another application of Joseph Campbell’s “A Hero’s Journey” played out in plastic molded primary colors. Kudos to the director/writer team of Phil Lord and Christopher Miller (Cloudy With a Chance of Meatballs) for assembling an excellent movie that kids and parents both will enjoy. The theme of the movie resonates throughout, and it all comes together in the end. This movie made me want to be a kid again, and for that reason I must give it 4 stars out of 5. Now, I have to go to Toys R Us.